John and I believe in balance: We work hard to play hard. We also enjoy fine foods and beverages, as well as physical activity. It just so happens that we found this balance during our recent trip to Willamette Valley Oregon Wine Country. 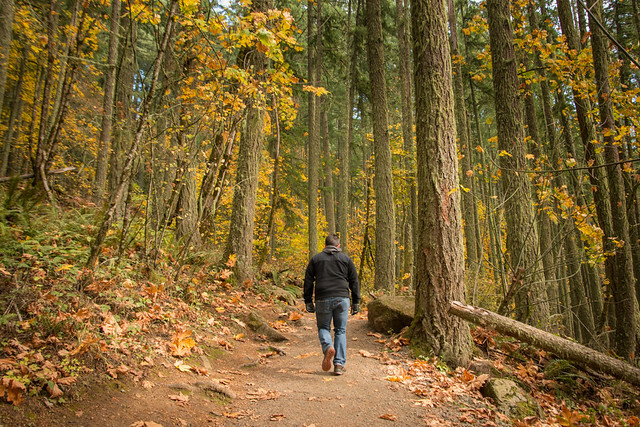 Before stopping in at Cardwell Hill Cellars in Philomath, Oregon, we went for a hike in the Beazell Memorial Forest, which is a testament to true love. For real! 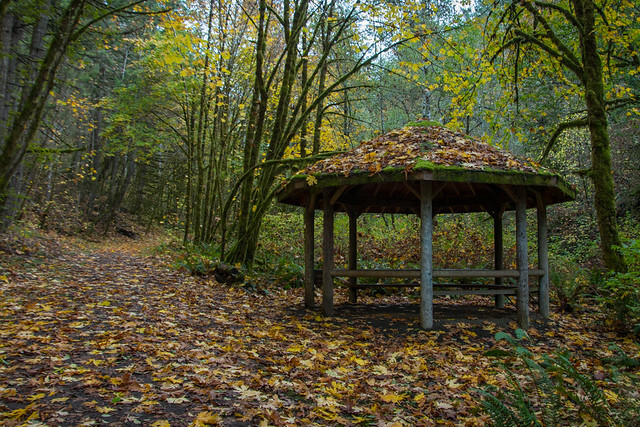 Even though my Cascadian heart finds forests utterly and hopelessly romantic settings in general, this one was specially created for all to enjoy thanks to a dedication from a beloved husband. 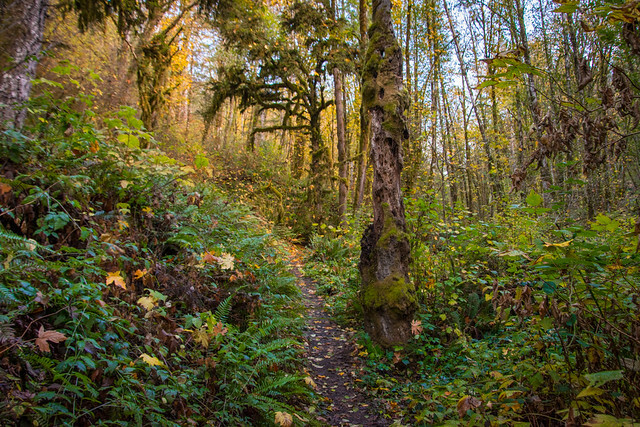 The forest has two main loop trails: The South Ridge Trail (3.1km round trip, elevation gain of 633 ft) and the Plunkett Creek Trail (4.3km round trip, elevation gain of 665 ft) which can join up with the Plunkett Creek Trail. We ended up on the creek loop and it was such a lush forest environment. 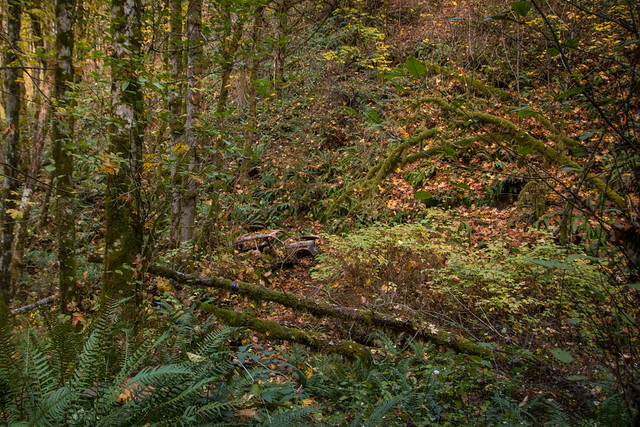 I know my Pacific Northwest Forests pretty well but this one was different. 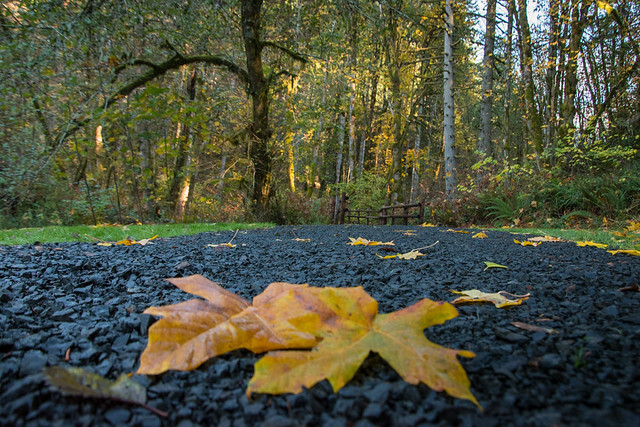 Groves of oak trees and old growth maples, red alder, wood fern, a Douglas-fir plantation and the colours of autumn leaves contrasting with the pitch black basalt rocks that made up the path. I’m used to wood chips and mulch so it was cool to see the region’s volcanic roots in the middle of the woods. Hike it with your sweetheart if you can, and tip your hat to Fred and Dolores. 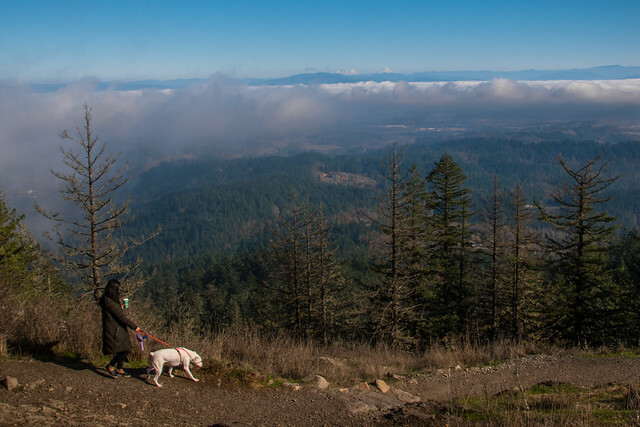 Spencer Butte is to Eugene what Quarry Rock is to Deep Cove. 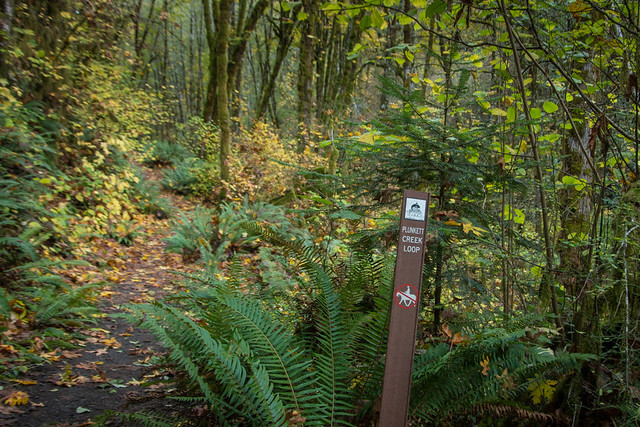 Grab a coffee to go and hit this hike in the morning before Sunday brunch reservation. It’s a busy trail, well traveled by families, dogs on leash, and sprinters who are in it for the exercise and not the selfies at the top. The parking lot starts off in a dewy meadow, already at a bit of an elevation above Eugene. There’s the “short way up” which is pretty much vertical with some boulder scrambling, then there’s the more leisurely 2.3km stroll through Douglas fir forest. You’ll gain 698 feet in elevation through switchbacks until you reach above the cloud line finding satisfying views of the entire region. 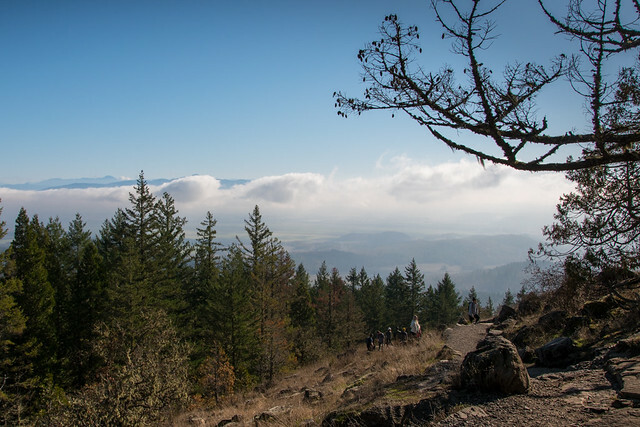 At the top there’s room to pause, have a snack, finish your coffee (or chug some water like I did) and enjoy a 360 degree view of Eugene. Spot the Three Sisters peaks to the east, which are part of the Cascade Volcanic Arc, along with ranches, rivers, lakes and the University of Oregon in the distance. Chat up a friendly doggo that made the hike up, and head back down the scenic route to hit up that local craft brewery (like Falling Sky Brewing where we had our own brunch). 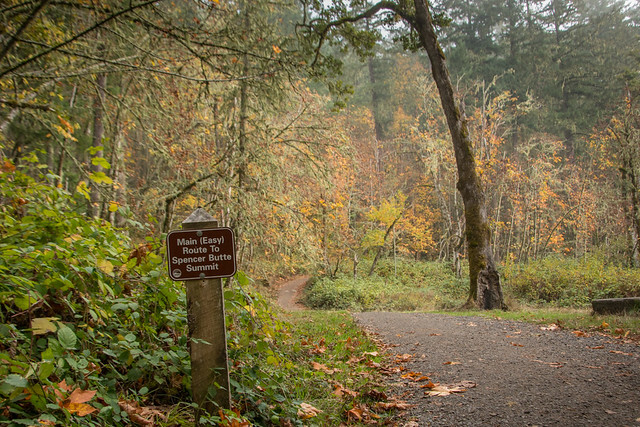 There are many more hikes to choose from in the Eugene area, which is also known for its waterfalls. Follow #OregonWineTrav on Facebook, Twitter, and Instagram for more info and to plan your visit to this Pacific Northwest region. Find Eugene, Cascade & Coast on Instagram, Twitter, and Facebook too. Experience sponsored by Willamette Valley Oregon Wine Country along with Eugene, Cascades & Coast. Views and opinions are my own.